Mad Shadows is “Cozy Gothic Noir,” highly recommended for occult mystery readers. As before, Joe Bonadonna entertains in splendid fashion. His Dorgo character is a supernatural detective with a righteous side, and who wields a dowsing rod to probe/locate weird things. This is what you get by mashing up “Who Dunnit? Mystery” with “Lovecraftian Mythos” and “Leiber’s Adventures in Lankhmar.” Mad Shadows II: Dorgo the Dowser and The Order of the Serpent extends his adventures, world, and background, being a sequel to Mad Shadows: The Weird Tales of Dorgo the Dowser). Again Dorgo has allies; friends include constables, Mazo Captain of the Purple Hand and Sergeant Evad Thims, and the halfing/hybrids Muthologians like the physician satyr Praxus and gambler cyclops Vorengi. Favorite locales like the Hoof and Horn Club in the city of Valdar are revisited. (1) MSII’s chapter episodes are longer (novellas) and have a common story arc. (2) We learn more about Dorgo, partly through a relationship with Valuta Jefoor, a regal lady with a passion for ghouls. 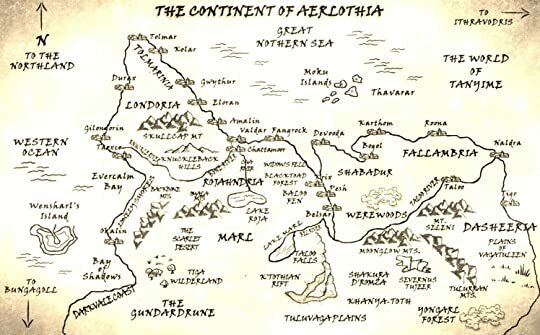 (3) Erika Szabo’s “Map of “Continent Aerlothia / World of Tanyime” broadens our vision (the map is not needed to enjoy the story, but is well drawn and many of the locales in the map are not mentioned in the stories, which fans may interpret as there is even more to Dorgo yet to come. Chapters I and III are new to the world, but Chapter II, Book of Echoes was my first Dowser/Joe Bonadonna experience published in an earlier form within Azieran Adventures Presents Artifacts and Relics: Extreme Sorcery. According to the author (via Facebook conversation) the first scene and finale were somewhat influenced by the 1950s film version of Mickey Spillane's "Kiss Me, Deadly." I enjoyed this so much that I purchased Mad Shadows: The Weird Tales of Dorgo the Dowser immediately. In MSII, Book of Echoes has been revamped to extended Dorgo’s relationship with the lady Valuta as well as the bullying Khodos brothers. The cross-over to the Azieran series is maintained. There are also extended descriptions of Valdar’s workings, such as the Wheel, a device to enable people to drop off babies to an orphanage. This had eerie overtones of the author’s MS1 dedication to: “Mary Ellen Pettenon and the other 91 children and 3 nuns who became angles too soon in the Our Lady of Angels School Fire, December 1, 1958.” I learned on Facebook that Bonadonna is a long time Chicagoan, who was in the same school system and if his birthday was a few months different, he would have been in the building. In the book, we learn early on that Dorgo is an orphan, and many of the plots/character-motivations are based on family ties. Still need more! : As Dorgo develops, I long for more insight into his past. We know that he is a veteran of the Wandering Swords, a band of mercenaries. And we know that the dowsing rod was given to him by a “grateful Yongarloo shaman” after Dorgo rescued his daughter from a gang of slavers. “How he got it, where he got, he never said and I never asked,” says our protagonist. It seems the longer he has the rod, the more he build a symbiotic relationship with it. I would welcome any more Dorgo, but would enjoy some revelation of the past in future volumes. Official Synopsis: Dorgo the Dowser lives in a world where life is cheap and souls are always up for sale. Armed with a unique dowsing rod that can detect the residue of any supernatural presence or demonic entity, he can sense the vestiges of vile sorcery used in the commission of crimes. His adventures pit him against inter-dimensional creatures, friendly ghouls, raging cyclopes, psychopathic satyrs, and monstrous insects . . . not to forget a criminal underworld of duplicitous women and dangerous men. This time around, Dorgo falls in love with a witch known as the Girl Who Loves Ghouls, battles creatures from another dimension, and meets one very special werecat named Crystal. It’s also the first time he hears about an ancient death cult known as the Order of the Serpent. Then, after a young woman is murdered and a deadly, dangerous book of arcane lore is stolen from her, Dorgo comes closer to learning more about this secret Order. But first he must battle both humans and demons in order to find and destroy “The Book of Echoes.” Finally, Dorgo squares off against a horde of fiends born of dark sorcery when he tries to help a young girl who became trapped inside a powerful spell while attempting to destroy someone calling himself Ophidious Garloo. Racing against time, Dorgo the Dowser uses every trick he knows to uncover the secret identity and learn the True Name of Ophidious Garloo -- the Undying Warlock who may very well be the leader of the Order of the Serpent. More magic, murder, mystery and mayhem in this sequel to Mad Shadows: The Weird Tales of Dorgo the Dowser. MAD SHADOWS II -- DORGO THE DOWSER AND THE ORDER OF THE SERPENT. . . Heroic Fantasy with a film noir edge. Available in paperback and Kindle editions from Amazon, Smashwords, CreateSpace, and other online booksellers.